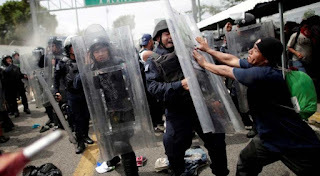 President Donald Trump said Friday that the United States will eliminate all economic assistance to Guatemala, Honduras and El Salvador in retaliation for the caravans of Central American migrants arriving at the southern border. 'Honduras, Guatemala and El Salvador are doing nothing for US,' says Trump vowing to end all aid . Trump made a similar threat in October, when he said he would "substantially" cut aid to countries making up the Northern Triangle of Central America, but his words were not followed by any action. During the 2018 fiscal year, which ended Sept. 30, the US allocated $84 million in assistance to Guatemala, $58 million to Honduras and $51 million to El Salvador, according to figures from the State Department. Some those funds was channeled through the US Agency for International Development (USAID), while the Pentagon provided a total of $42 million across Central America in 2017 to support the war on drugs. The White House's proposed 2019 budget includes $69 million in aid to Guatemala, $66 million to Honduras and $46 million to El Salvador, a reduction of 29 percent from the levels of fiscal 2018. The president cannot unilaterally block the disbursement of aid authorized by Congress for the region, according to the Washington Office on Latin America (WOLA), a think-tank. Immigration to the US from the countries of the Northern Triangle has increased in recent years. Since October, at least 9,000 Central Americans, mainly from Guatemala, El Salvador and Honduras, entered Mexico in several caravans hoping to reach the US border and apply for asylum. Roughly half of them are gathered in Tijuana, just across the border from San Diego.